Parham Plaza Hotel is in the center of San Pedro Town, across the street from the central park and the beach. Guests are just a short walk from the airstrip and the piers from which the water taxi and most excursions depart. Just around the corner, you’ll find excellent restaurants, great shopping, and exciting nightlife. Parham Plaza Hotel’s ten spacious private rooms all include A/C, private restrooms, free wifi, and cable TV. With its grassy lawn full of tropical flowers, Parham Plaza Hotel boasts the largest green space in town, which is the perfect place for guests to barbeque, lounge in the sun or head up to our breezy treehouse to read, chat or share a piña colada with friends. Although we are centrally located, our expansive fenced grounds offer the privacy and tranquility of a more remote location. 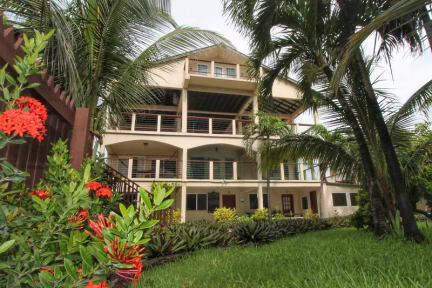 In fact, right on our property, you can enjoy the sights and sounds of Belizean wildlife, including iguanas, tropical birds, lizards, frogs, etc. In addition, all guests are welcome to enjoy the 1,600-square-foot rooftop pavilion with its stunning ocean view, sofas, hammocks and a full community kitchen. There are hundreds of thrilling things to see and do in Belize and our friendly staff can arrange any tour, excursion or adventure you’d like. 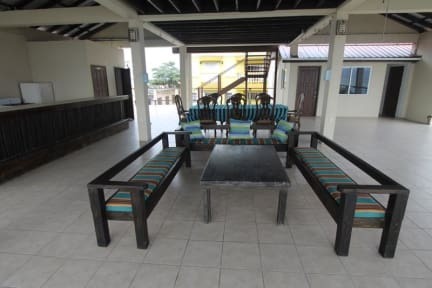 From snorkeling or scuba diving to cycling or kayaking, from visiting Mayan ruins to flying over the magnificent Great Blue Hole, Parham Plaza Hotel is a one-stop shop for organizing all your activities in Belize. We look forward to seeing you soon! Really a great place to stay. We had 4 people and the room was fine for that many. I would highly recommend this place. Hotel was absolutely amazing! When we arrived they had upgraded our room for us for free. The guy working at the front desk was so pleasant and full of helpful information! The room was perfect. Very clean, spacious and comfortable. Highly recommend this hotel! Staff is very nice and helpful, super clean hotel with a great location. The staff was extremely helpful as well as knowledgeable about things going around in the city! Would most definitely stay here again! Thanks you guys for catering to our needs. Really great accommodations for a great price. We missed our flight and had to change our reservation and staff were so friendly and helpful. Room was beautiful, located close to the water taxis, and had plenty of hot water. I would definitely stay here again. We stayed one night for NYE. Fantastic view from the second floor, the owners made rum punch - was a great night! Plenty of hammocks & chill areas to relax. rooms in excellent condition with fridge, hot water & good AC. 1 min walk to water taxi & in amongst the shops, bars & restaurants. Obviously it was big party at surrounding clubs and in the main square on NYE, cannot comment on noise levels on other nights. Very nice stay. Room was spacious. Shower got hot and had nice water pressure. They had coffee! No other place we stayed had this so it was a real treat. It’s set back from a busy street so we felt safe. Place was very clean, located right in the center of San Pedro. Close to the bars and great food. Staff is incredibly helpful as well. The rooms are air-conditioned and have beautiful views on the upper floors. Would stay again. I loved it. Beautiful view, clean beautiful rooms, lovely staff!! !